Personal Level of Service • As an independent company built on reputation, we are extremely passionate and proud about what we do, providing a more personal level of service excellence. Manageable Approach • We offer a variety of innovative services under one umbrella; reducing invoices and technician visits for a more manageable approach. Sustainability • We offer a ‘waste to energy’ incineration process for the disposal of clinical waste. 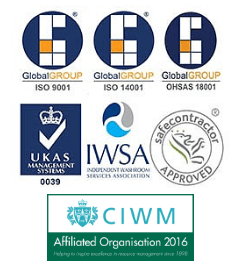 ISO 14001 accredited, services are managed with respect for our environment, helping to reduce sustainability targets. Compliance • Our designated service technicians are DBS checked. Waste transfer or hazardous consignment notes relevant are completed and issued on each visit ready for client audits. Consultancy • To help you find the right solutions for your business needs and compliance, a free survey and consultation is available to you.